So I was dutifully completing a project for Colaiste when my phone began to ring. It was farmer Richie, who informed me of 2 additions to the farm. So at a pace approaching the speed of sound, I was up and grabbing the nearest camera and hopping about whilst simultaneously trying to get a coat and farm shoes on (my farm shoes are an asics graveyard, all my old ones!) and not drop aforementioned camera. Having completed all of the above to the best of my ability (i.e. 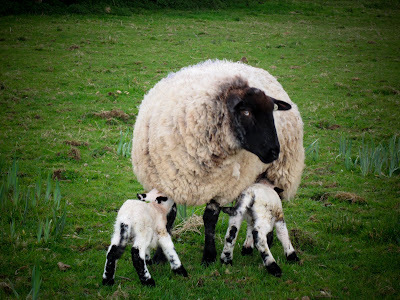 coat buttoned up wrong and 2 left shoes on) I flew out the door looking wildly for fluffball looking mini sheep. Up the hill and over the gate and there they were in the far corner. 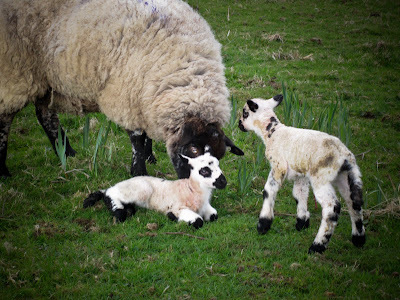 I didn’t want to panic mammy sheep as she may actually have another lamb, these are just born, so I just snapped a few photos. We got a new Ram this year, and I call him Panda-ram. Ok I’ll tell you, he looks like a panda. I know, I know, it’s seriously cryptic. But this here ^^ is like a genetics lecture. He has panda lambs too. It’s a panda phenotype. I just.. They are so so cute. Awww, it fell down! Mammysheep is quite concerned. After this I decided to give them all a bit of a break and left them in the corner. We’ll go up later and bring them into the hayshed for the night where its all lovely and warm and dry! Right. So. 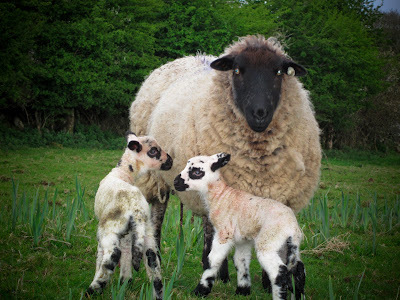 We do need to name our lambs so I am looking to you for suggestions! Categories:Animals Humor you say? Humour you say? Life on the farm Photos! 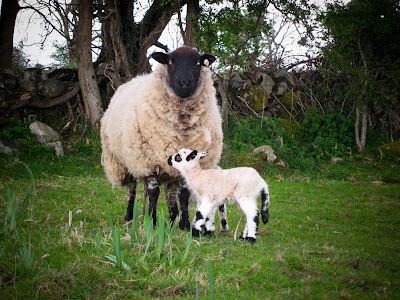 Random mumblings The farm.Tags:Baby lambs cute farm Ireland irish lambs Mayday Name Name the lambs New lambs Panda sheep Suggestions? Harry and Linda. Do you know if they’re boy or girl lambs? Why is Oreo cliche? I rather like that one.. What am I missing here? Also, we should use Oliver when we get a pet. Orphan. Geddit? Pandas at the zoo always seem to get Chinese names like “Ling Ling” or “Ming Ming”. My chinese is weak, so a quick perusal of my take away menu has yielded Wonton, Chow Mein, Kung Pao and Moo Goo Gai Pan as appropriately delicious names. Or Chuck and Berry.